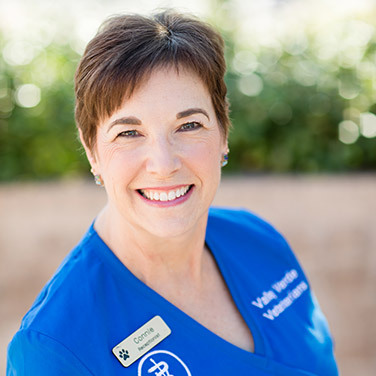 Connie joined our team at Valley Verde Veterinarians in August of 2015 as a receptionist. It is important to her to make sure our clients are greeted with a smile every day as they enter the clinic and to be ready to assist them in any way that she can. Connie left her home state of Michigan and moved to Green Valley with her dog, Maddie, in 2012, joining her parents who have been residents for over fifteen years. She has two adult children who both live in Michigan and one grand-doggie, Thor. In her free time she enjoys spending time with her dog, cross stitching, baking (and bringing goodies to her co-workers!) and spending time outdoors.